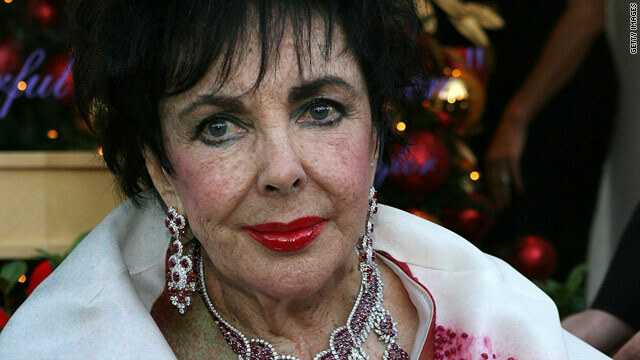 Elizabeth Taylor in Beverly Hills, California, in 2007. Explaining that a convert to Judaism is considered "a newborn child," the article recounted the conversion of 27-year-old actress Elizabeth Taylor to the faith. Her newly acquired Hebrew name, used in ceremonies accompanying life cycle events, combined the Hebrew version of Elizabeth with her biblical heroine, Rachel, Jacob’s favorite wife. Raised a Christian Scientist, Taylor’s decision wasn’t sudden. She first thought about converting when she married movie producer Mike Todd, her third husband, who’d been born Avrom Goldbogen and was the grandson of a Polish rabbi, Time reported. But the theory that Todd - or that her soon-to-be next Jewish husband Eddie Fisher - provided the impetus for her conversion was one she disputed. Taylor's conversion came a year after Todd’s death in a plane crash, Benjamin Ivry wrote Wednesday in The Forward, a Jewish newspaper. Judaism is not a proselytizing faith. In fact, an ancient practice that some rabbis still follow is to turn away would-be conversion candidates three times before agreeing to work with them as a way to test their commitment. Taylor reportedly studied for about six months with the late Rabbi Max Nussbaum, a Holocaust survivor affiliated with Judaism's Reform movement and with Hollywood’s Temple Israel. She was assigned books to read and engaged in conversations about traditions and the struggles weighing on Israel, Time reported. Nussbaum, Ivry of the Forward wrote, “was no star-struck pushover,” even though he’d long been linked to celebrities, performing funerals for people including Al Jolson, Fanny Brice and Sam Goldwyn. Not long after Taylor's conversion, he also would perform the controversial wedding of Taylor to Fisher. Last August, The Jewish Journal in southern California published a blog post by Danielle Berrin about Taylor and her Jewish identity. The piece was written soon after the publication of “Furious Love,” which chronicled the actress’s volatile relationship with Richard Burton. The blog post recounted a scene in the book in which the couple went at it over “who was more ‘Jewish,’” Berrin wrote. The JTA, a global Jewish news service, posted Wednesday a blog listing archived stories about Taylor. Among them was a piece about how her 1959 purchase of $100,000 in Israel bonds prompted a ban of her films by authorities of the United Arab Republic. Another story recounted how Taylor sang in 1961 a Hebrew duet with Fisher in Moscow, while surprising United States servicemen who were stationed in the Soviet capital. And in 1987, she was among those who signed an appeal launched by a Jewish feminist magazine, Lilith, to free Soviet refusenik Ida Nudel. But her name was later removed from Egypt’s blacklist, after “officials decided the film was good publicity for Egypt which is mentioned 122 times in the movie,” JTA reported in 1964. The JTA archives also reveal that Taylor “offered herself as a hostage for the more than 100 Air France hijack victims held by terrorists at Entebbe Airport in Uganda during the tense days before the Israeli rescue raid” on July 4, 1976. That revelation was reportedly disclosed when Taylor and then-husband John Warner were honored at a June 1977 gala for the Jewish National Fund, an environmental organization best known for its tree plantings in Israel. 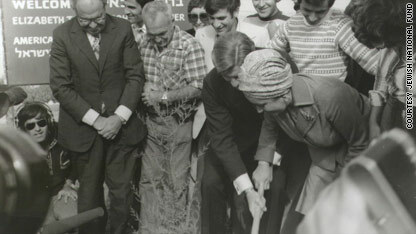 Elizabeth Taylor and husband John Warner plant a tree in a forest named for them outside Jerusalem. Israel’s then-ambassador to the United States, Simcha Dinitz, gave the couple a certificate for a forest planted in their names near Jerusalem. “Taylor’s offer was ‘appreciated’ and ‘the Jewish people will always remember it,’” Dinitiz said, according to the JTA. In response, Taylor shared these words, the JTA reported: "'The trees we planted with our own hands in Israel symbolize a new hope that the whole world, Christian, Jew and Arab, will live as one in harmony under God.'" A couple years later, she signed on to narrate "Genocide," a documentary about the Holocaust that went on to win a 1981 Academy Award. Taylor's participation in the project, which was the first film produced by the Simon Wiesenthal Center, and her connection to center founder Rabbi Marvin Hier were recounted in a Jewish Journal piece published Thursday. How much Judaism played into Taylor's life in recent years is unclear. But the Jewish Journal reported in its obituary that Taylor had been a supporter of the ﻿﻿Kabbalah Center in Los Angeles. And Ivry of the Forward suggested that Taylor's relentless campaigning on behalf of AIDS research and treatment reflected a deep understanding of the Jewish commitment to tzedakah, or charity. In the Jewish tradition, a person is laid to rest as soon as possible after death. A small funeral service for Taylor was scheduled for 2 p.m. Thursday at Forest Lawn Cemetery in Glendale, California. Rabbi Jerry Cutler of Creative Arts Temple conducted the service. He describes his community as "unorthodox," and the temple website says it is one that seeks "the joy of Judaism through the creative arts." Out of respect for Taylor's family, Cutler would not comment Friday morning on the late actress. Others have voiced my confusion above, but it's good sometimes to add for the melee. I have been signed up since the middle of January, but have three letters. They're great letters! But similarly, I'd like to know if this is just the process of your dust settling or if this is to be expected?